Goals from Ryan Lowe and Kevin Ellison rescued a draw for Chester as Luton finally moved onto zero points after they had begun the season on minus 30. 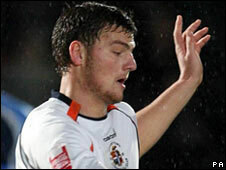 Luton took the lead through Chris Martin who finished left-footed from inside the box for 1-0. Lewis Emanuel's stunning free-kick from the edge of the area then made it 2-0. Lowe pulled one back from the spot after Ellison had been fouled before he himself later bundled home from close range after Kevin Robert's header. Chester: Danby, James Vaughan, Linwood, Kelly, Roberts, Partridge (Barry 65), Mozika, Hughes, Wilson, Lowe, Ellison (Harris 81). Subs Not Used: Platt, Rutherford, McManus. Booked: James Vaughan, Wilson, Kelly. Goals: Lowe 37 pen, Ellison 52. Luton: Logan, Spillane, Roper, Beavan, Emanuel (Howells 45), Henderson, Jarvis, Keane, Craddock, Gallen, Martin. Subs Not Used: Brill, Gnakpa, McVeigh, Hall. Goals: Martin 22, Emanuel 27.